NGC 6503 is a dwarf spiral galaxy that resides on the edge of a section of space known as the Local Void - a region of space nearly absent of any galaxies or other features. The galaxy is about 1/3 of the size of our Milky Way galaxy, thereby earning the "dwarf" classification. In this image, North is up. This image is cropped to 67% of the original full frame. Software Used Sequence Generator Pro for image capture, Astro Pixel Processor for calibration, pedestal addition, normalization, integration, and initial DDP stretching. Images Plus for star size reduction, edge masking, feature mask, and noise reduction. Photoshop CS5 used for levels and curves, saturation adjustments, selective color, match color, and high pass filter. Gradient Xterminator for gradient removal. Carboni Tools for additional noise reduction and smoothing. Registar 64 for stack alignment. Focus Magic for focus restoration. PlateSolve 2 for plate solving. Notes Unfortunately, when I was capturing this image, I had just started using my ES152 6" refractor. The telescope had some severe problems with astigmatism, and it made for very poorly shaped stars and a loss of much detail. I almost didn't want to post this image because it's quite lacking. 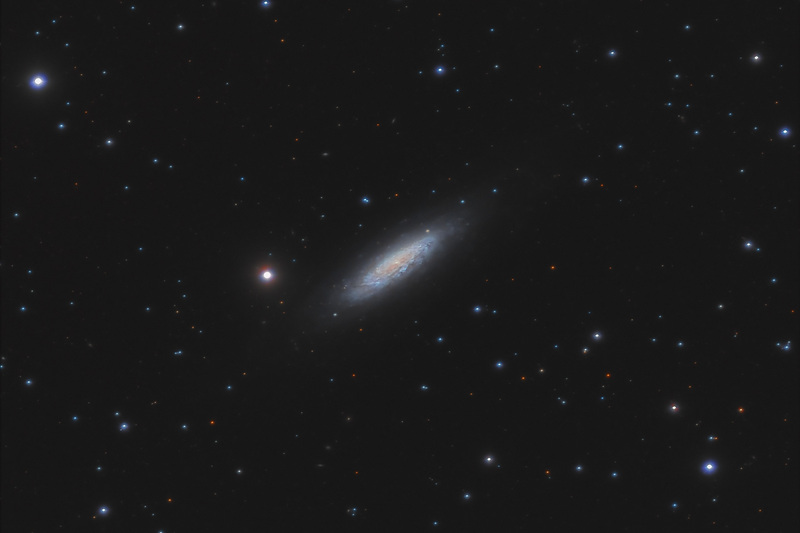 But, after you invest 20+ hours into imaging and processing, I guess I may as well show something! I sent the telescope's lens cell back to the manufacturer, and it came back much improved but still not quite right. I'll be sending it back once again and hopefully they'll finally have it all corrected!